Happy Holidays! Cheers to 15%! It’s that wonderful time of year! Here in the USA, Kristen and I are so thankful for our customers who have supported SWAK X this year. For us it has been such pleasure to be apart of an amazing mission to help those affected by HIV/AIDS. We are looking forward to what 2013 will bring! For our USA and Canadian friends, we hope you enjoy our gift of 15% off your next order on our site! Use promo code: ‘holiday15’ at the check out. This past Saturday marked Worlds AIDS Day, a day held each year to remember those whose lives have been affected by the disease. The organizations mission is “Getting to Zero” by 2015. Great strides have been made in prevention. In the past two years, the number of people with access to antiretroviral medication increased by 63 percent! Here at SWAK X USA, we are closely connected to this cause as our mission is to help make the lives better for those who are affected. Read here for an educational blurb written by Huffington Post. WWW.SWAKXUSA.COM NOW LIVE. Go get you some Swak x.
Oh man. I am just not even proud of how long it has been since my last blog post. And after promising to keep you in the loop. Really bad. BUT, Swak x has some VERY exciting news. We have been working long and hard to get our website polished and perfect so that we could make Swak x available to purchase online. As of today, SWAK X OFFICIALLY HAS LAUNCHED IT’S NEW US WEBSITE. And let me tell you, Kate is mostly thank for it (I am a little technology-challenged, there are days that I almost forget how to text). So for those of you who love to shop online, add http://www.swakxusa.com to your favorites list, and check back often as we will be expanding our stock to include new items frequently. These past few months have been a wild ride, and they have flown by. The last time I posted, we were just about to attend NYIGF in January (and yes, I know it is embarrassing that it has been 4 months since my last post). Kate and I trekked up from DC to meet Liora and 3 of our Swak x ladies for the week. None of the ladies had ever been to the United States, flown in an airplane or stayed at a hotel before an experience that all of the wonderful supporters of Swak x helped to make possible. We had the most wonderful week. The joy that radiates from the Swak x ladies is contagious. We also came back with LOADS of pictures and videos. I will be blogging over the next few weeks/months some of the footage that we got on our trip. I can’t wait to introduce you to our girls. They will share with you a little bit more about themselves, their lives and about their experience in the United States. These ladies have inspired me and have humbly put my world into perspective and I know that you will get to know and love the Swak x ladies the way that we do. Update soon. Until then, get your mouses (mice?) clicking to http://www.swakxusa.com. Official Countdown to NYIGF: 1 DAY!!!! We can hardly even believe it. The past few months of planning and preparing for the launch of SWAK X USA have been a whirlwind, filled with laughter, lots of late nights working, a little bit of stress (ok, maybe a lot) and more snacks than you can imagine. When we first started planning to launch SWAK X USA, we decided that NYIGF (New York International Gift Fair) would be a great launching point. And with its opening on Saturday, we will FINALLY be able to share some of the jeweled goodness that SWAK X has had going on in South Africa since 2009. We will be introducing 6 different collections of jewelry: 4 collections of necklaces, a collection of bracelets and a collection just for kiddos. SWAK X USA will also be carrying a product called Wrist2Hair (W2H), an elastic bracelet adorned with a bauble that can also be worn in the hair (we know that all of you practical gals will be just as obsessed with it’s multifunction use as we are!). Kate and I will both be attending the NYIGF, along with the creator of SWAK X, Liora. 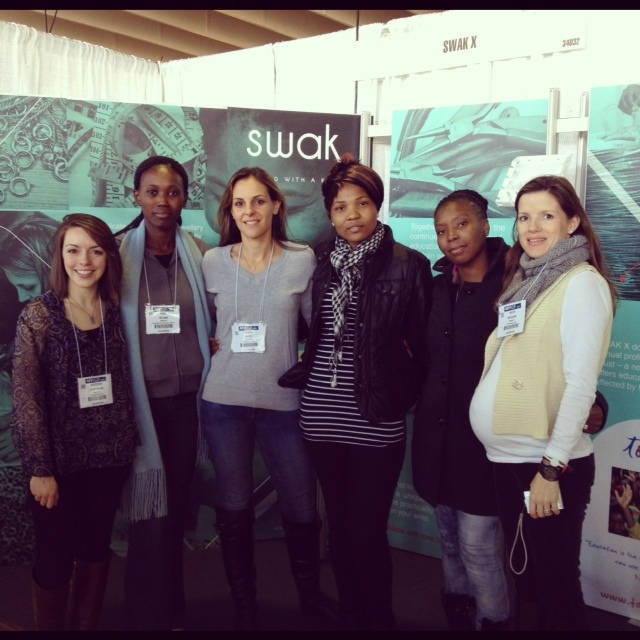 But what we are beyond excited about, is the other three women that will be attending with SWAK X. Three of the ladies that are employed by SWAK X (that make this incredible jewelry that we get to sell) will be attending with us. Through the combined generosity of some of our supporters, and the success of SWAK X in South Africa, enough money has been raised to sponsor these ladies’ trip to New York. This will not only be the first time to the United States for these women, but also their first time on an airplane. We are excited, they are excited, and we hope that you are excited too! It is opportunities like this that SWAK X was created to provide. We are confident that SWAK X will not only continue it’s success in the United States, but will thrive here. We will be posting updates of our experience at NYIGF and pictures of our booth, our products, our ladies….and maybe even our snacks. So be prepared. Sorry that it has taken us so long to get XOXO up and running, but we PROMISE to keep you guys updated. We cannot wait to share more of our experience with you! !